Most people when they first see the brace (aka power bar) they normally ask, "what the heck is that?" and "what is it supposed to do?" My answer typically goes like this: "An engine brace," and "Well, actually, I believe it does...." Bear with me. Looking for some unique performance enhancements, while browsing through some Japanese websites, I happened upon the Knightsports Power Bar. This is was new product that I believe Knightsports released in the summer of 1998. 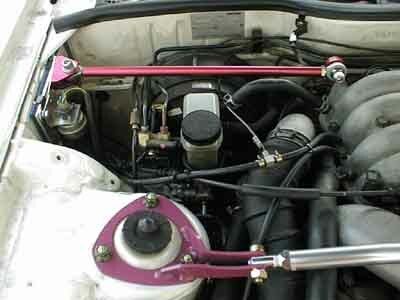 I also saw many Japanese car owner sites showing pictures of similar such items. Some using a solid bar and some using a damper (an adapted motorcycle steering damper). At the time I had personally not seen one on any other car. After doing some exploration I found that the Knightsports Power Bar would set you back about $380! Heck, I bet I could make my own. And so I did. I designed the brace using a solid modeling program and from there fabricated a prototype brace using hardware from a racing supplier and some aluminum stock I had leftover from other projects. I used this prototype with great succes for almost two year both on the street and on the track. 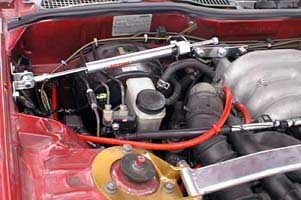 My theory on its purpose are that it minimizes engine windup during rapid throttle applications. This not only will increase throttle response but also add to the longevity of the OE lower motor mounts which are somewhat prone to failure. Additionally because there is less movement in the drivetrain the shifter postion is less prone to movement which commonly results in missed shifts and subsequent synchro damage. Some issues that were addressed were clearing the ABS pump (Japanese powerbars need only clear the brake booster) and minimization of vibration and noise to the chassis. Issue one wasn't really an issue as it cleared fine and issue two has been somewhat addressed by using some high density impact foam (prototype only - rubber for the production units) between the chassis mounting bracket and the fender wall. No other modifications to the car were made. 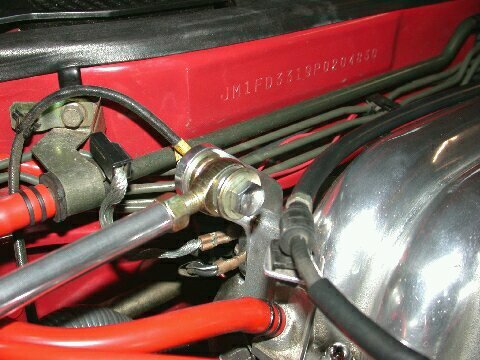 The bracket to the upper intake manifold (UIM) uses the engine hoist bolt holes and there are two factory prethreaded bolt holes in the fender wall for the chassis bracket. The bar itself is adjustable for length by loosening the jam nuts and turning the bar by hand. 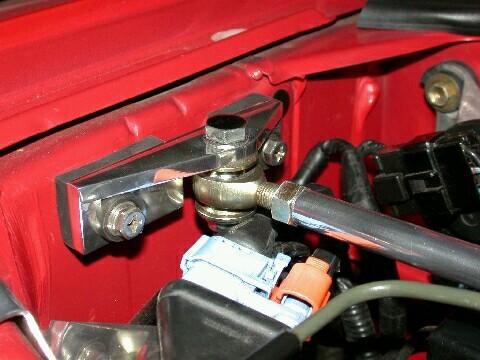 Changing the length of the bar preloads the engine mounts in either direction as desired. My only concern was the potential for excessive loads to be imparted to the manifold which might prematurely degrade the gasket interfaces to the lower extension manifold. However, after two years of track and street use there has been no indication of any problem. 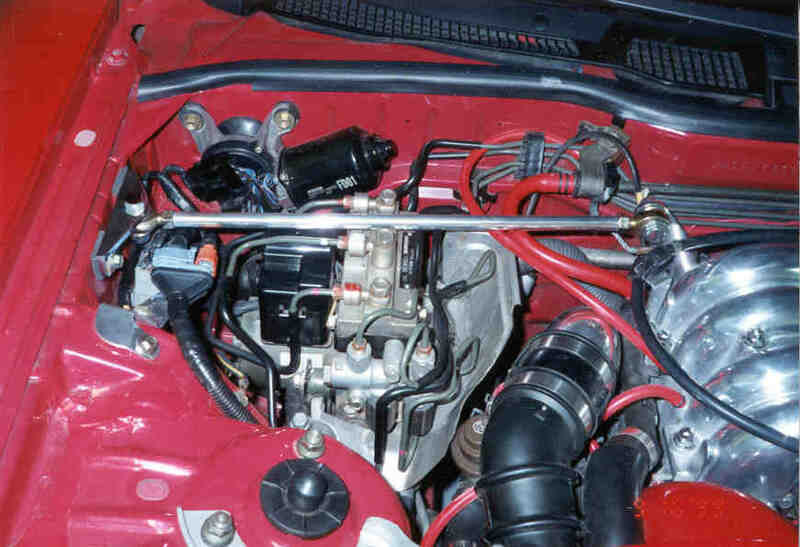 In addition similar devices have been around for 2nd generation RX-7's for ages with no real problems that I could find. 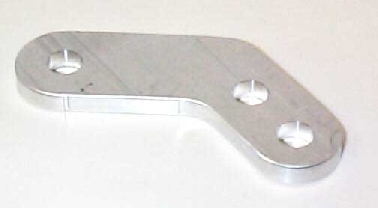 The final Triple-R Engine Torque Brace from the first prodution run. Well it seems my design, of which I have helped many replicate, has reached such a demand that a production run was undertaken with the assistance of Phillip Keezer. The production unit was produced using a CNC machining process for the chassis fender bracket and the UIM bracket was laser cut thus holding the tolerences to much higher level than what I could produce by myself. The finished production model comes with all the necessary mounting hardware and instructions. Pictured below are details of my own production model from the first run of 40 units. Note: Some minor differences may exist in hardware due to availability but all function in the same manner. The purchased items do NOT come polished but with a high quality machined surface. If interested in one of these devices they can be purchased through the RX-7 Store Look under "Engine Parts"